Getting ready to move to a new home? These 8 easy moving tips will help ensure that your move goes smoothly. Planning a move can seem like an overwhelming task. But, it doesn’t have to be. With a little planning, some good advice and few simple tricks up your sleeve, you can create a game plan that will make your move hassle-free. To be ready for your moving day, you’ll want to start the clean out process a good 6 weeks before your moving date. Yard sales, organizing donations and getting things listed on eBay and Craigslist all takes time. But, if you get started early you will reap the rewards. Not only can the proceeds help pay for your move, but you’ll lighten your load and moving costs. Look for donation services that will pick up as well as sort and recycle items for you. This will save you loads of time. Don’t forget to keep a record of any donations, your moving expenses and your receipts. If your move is related to your work you may be able to claim your moving expenses as a write off on your taxes. Skip the cardboard and rent reusable plastic boxes instead. Called “green boxes” these sturdy boxes come in multiple sizes and they are strong, stackable and waterproof. And here’s my favorite part – no tape required! What does this mean for you? Fewer boxes mean less to move, and less cardboard means less clutter and recycling once you arrive – all good reasons to go green. To find a box rental service in your area, do a web search for “green moving supplies”. No green box service? You can still go green by reaching out to your local grocery and liquor store for leftover boxes. These boxes are built strong and often have handles to make carrying and stacking easier. There is one type of box that is worth investing in – the wardrobe box. With a wardrobe box, you can go from rod to rack and back again, saving you time when packing and unpacking, not to mention lots of ironing. Extra Moving Tip: If you have kids, an empty wardrobe box can make a great fort. This will help to keep younger kids happy and occupied until the toys are unpacked. Just make sure to remove the bar first. Pack and unpack by room. This will help you keep your things organized and in the right place. Plus, it will make the packing and unpacking more manageable on both ends of your move. Add room names to your boxes and number them. Keep a list of how many boxes go to each room this helps you take a quick inventory upon arrival. Colored duct tape can help you organize by color too. Upon arrival – Put a sign on each room and deliver the boxes to each destination. When packing, have a supply of Ziploc bags, in several sizes, on hand to keep cables, hardware, picture hangers, and other odds and ends together. Tape the Ziploc right onto the item it goes with. This will save you time when setting up in your new home. Plastic recycling containers also work great for corralling odds and ends. Here is a helpful moving tip that veteran movers know well – pack an overnight bag with all the essentials you’ll need upon arriving including sheets, towels and basic bathroom necessities (soap, shampoo, and toilet paper). If you have a pet, don’t forget to pack a few essentials for them too! Before you unplug your electronics snap a picture of your setup to remind you how it all goes back together. Label the cables with a piece of masking tape including which data port it goes to. This will save you lots of time and frustration when you are ready to set your electronics systems up again. Are you moving lots of large items such as furniture? Are you moving valuable or expensive items? Do you have time to recover following your move? Do you have a willing and able group of friends? If you are expected at work the next day, you need to move fast or you’re moving large or valuable possessions that require insurance, it’s worth it to hire professional movers. Even if you are hiring your own truck, hire some professional movers to help you load and unload. You’ll save yourself time, effort and energy. Energy that you can apply to unpacking and settling in to your new home. Have a group of friends ready to help out? Lucky you! Make sure to that you are completely packed when they arrive, have food and drink available and give them first dibs on any items not going with you. Have your new home professionally cleaned before you move in. This will save you time and effort when you arrive and will allow you to start unpacking and settling in straight away. Make sure any large appliances such as a refrigerator, dishwasher, oven and clothes dryer are cleaned as well. Add this to your request list if you are still negotiating to buy or rent your new home – you’ll be glad you did. It’s also a good practice to have the home you are leaving behind professionally cleaned as well. This is especially important if you are renting. Take pictures following the cleaning, so that you have proof of the condition your home was left in. Not only will the new occupants be grateful, but you’ll improve your rental references. You need to arrange to have the utilities turned off in your current home on the day following your move but also turned on in your new home. Nothing is worse than arriving at your new home and not having hot water or electricity. Having your Wi-Fi and cable ready are an added perk that will help you settle in faster. If possible have your utility services turned on the day before you arrive and check to make sure everything is working, or ask your agent to check for you. Create a floor plan of your new home to help you to know what fits and what won’t – before you arrive. This will save you time, money and effort when moving. A floor plan is one of the best visual tools that you can use to help organize a move. Lay out your rooms ahead of time, determine what will go where, use it as a guide to unpack and more! For example, this 3D Floor Plan clearly shows you how different rooms can be set up. 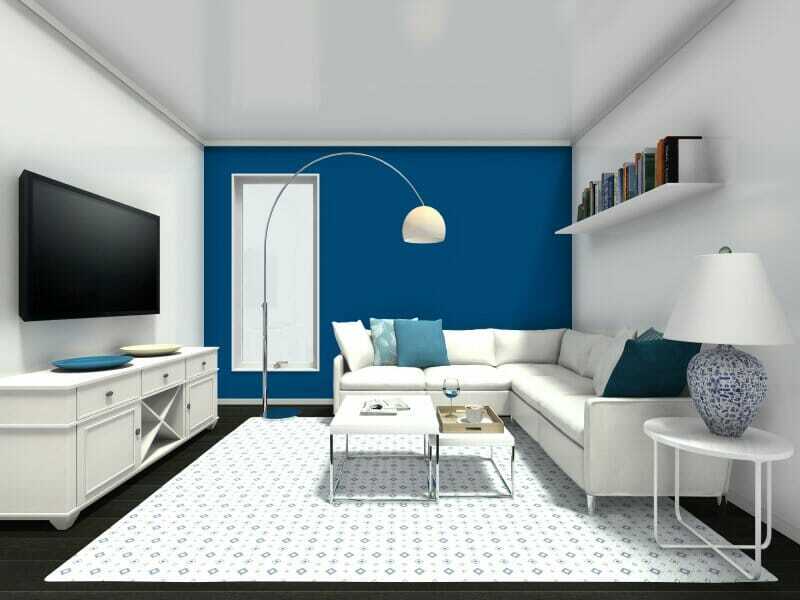 It was created using RoomSketcher Home Designer – an easy-to-use floor plan and home design tool that you can use to plan and organize your move. Draw your floor plan and furnish and decorate it using the easy drag and drop tools. The RoomSketcher Product Library has thousands of items to choose from and you can resize any item to match your own. Not only can you lay out furniture, but you can see how your rooms will look by taking a Snapshot! Visualize what paint colors to use in your new rooms, try wallpaper, tile and carpet ideas, you can even figure out where to hang artwork – all ahead of time. RoomSketcher Home Designer is so user-friendly that even kids can design their rooms. Get the whole family involved and excited about your new home! Apply these easy moving tips to your game plan. You’ll not only ensure that your move is a smooth one, but it will help you unpack and feel more settled once you arrive. Get started planning your move with these easy moving tips and RoomSketcher Home Designer. Short on time? No worries. You can order your floor plan from the RoomSketcher Floor Plan Services – all you need is a sketch or a blueprint.